Felver’s portraits, and excerpts from Native American writers, emphasize the interconnectedness of Native communities. Three generations. Ninety-six authors. Thousands of years of ancestral wisdom, imagery, and lore. 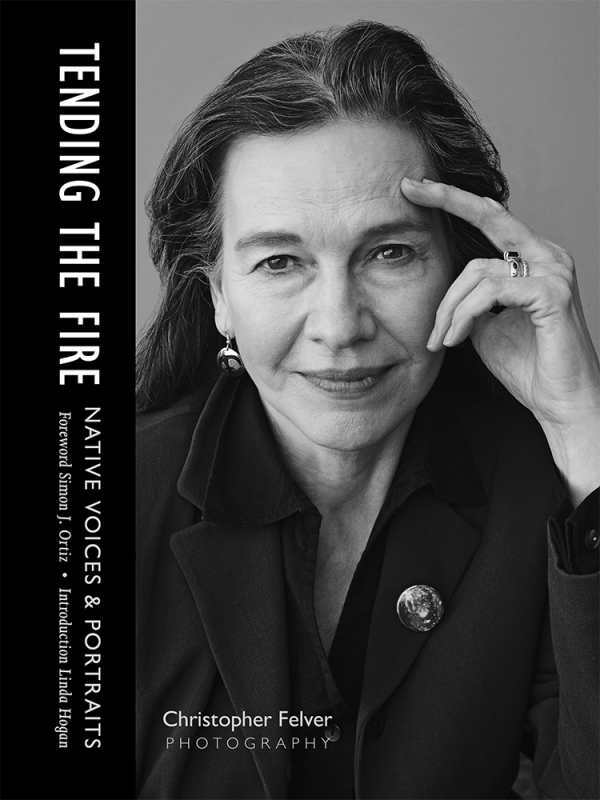 That’s what’s inside Tending the Fire: Native Voices and Portraits, a compelling visual and literary introduction to indigenous American authors. Christopher Felver collected short handwritten pieces from the contributors; these are displayed across from his black-and-white photo portraits. Writers eye the camera levelly and forthrightly, evincing the gorgeous diversity of Native American physical appearances, a trait echoed in their divergent writing styles and themes. There are whimsical song lyrics from Martha Redbone, a graphic novel snippet from Arigon Starr, impassioned poetry by Travis Coke, and an excerpt of a memoir by Diane Wilson. The rock stars of the Native American literary movement are here, too, including Alexie, Silko, Momaday, Erdrich, and Harjo, alongside lesser-known talents to savor. Felver’s lively 2015 interview with Mary Jean Robertson, host of Voices of the Native Nation, comes in midway. Robertson shares her encyclopedic knowledge of American Indian history and activism, and reinforces some common themes that ripple through the book, including of environmental stewardship and the need to more equitably shift governance from the resource-grabbing few back to a more collective model. While it is most expressive to read the contributors’ words in their own handwriting, particularly when they are adorned with illustrations, some of the writers have the impenetrable script of a harried physician. The volume concludes with short biographies of each of the writers and is satisfyingly summed up in Felver’s epilogue of how the book evolved, reinforcing the “interconnectedness of Native communities.” Tending the fire, indeed.